A 70 Y/O man did some welding on his car in Nuremberg, Germany yesterday. On a public road. Between other parked cars. The end result as dramatic as it is, isn't exactly surprising. 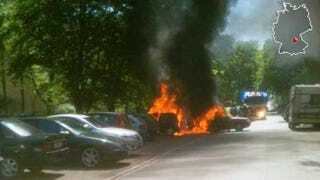 Witnesses say that he tried to drive it away once it caught on fire to save the Golf and the Lupo. Too little, too late!